May is always a busy and fun month for us, but this year it’s even more special. This May, today in fact, we’re celebrating one year of food blogging! We’ve got some special posts planned for this month, including a post where we’re going to tell you all the stuff we’ve learned in the last year about food blogging. You won’t want to miss that post. We’re going to be honest, frank, and hopefully help some of you thinking of starting your own food blog to start the process for yourself. The other reason this month is special for us is because it’s both Mae’s and her Dad’s birthdays. Their birthdays are only four days apart, so it’s a long-standing tradition that we celebrate in May. Of course, here in Canada, May also marks the unofficial start to summer. Canadians mark the event with a holiday affectionately known as May 2-4 (or more correctly, Victoria Day Weekend), but suffice it to say May is an exciting month. Now we love celebrating with our family and friends, so we decided to put a call out to some of our blogging buddies for their favourite cake recipes. Our blogging friends don’t disappoint and they loaded us up with cake recipes that’ll have us drooling for weeks to come. Without delay, here are 23 Cake Recipes to Celebrate Any Occasion AND Our Blogiversary (& Mae’s Birthday)! Looking for a healthier spin on cheesecake? Then you need this Better Than Nutella Cheesecake (Almost Raw Chocolate Hazelnut Cheesecake) recipe from The Taste Space. It’s loaded with cashews and hazelnuts… and has no added sugar! Having dietary restrictions doesn’t mean you have to forgo birthday cake! Our Fresh Kitchen offers up a gluten-free, vegan Zucchini Chocolate Cake that’s rich and decadent. If chocolate isn’t your thing, try this Genoise with Strawberry Ice Wine Sauce from More Than Burnt Toast. This simple Italian sponge cake is elevated with beautiful fruit sauce. Up next, another fantastic vegan chocolate cake recipe — this one baked in a loaf pan! This Best Ever Chocolate Vegan Cake from Imagelicious can be topped with an orange-essence chocolate glaze. Delicious! This cake recipe from Dish ‘n’ The Kitchen has us intrigued, especially since one of its ingredients is one of Gregg’s favourite sodas – root beer! Just as intrigued as we are? Head on over and grab up the recipe for this Root Beer and Tonka Bean Birthday Cake. Want to add a little colour to your birthday cake without artificial dyes? Check out this Rainbow Swirl Cake with Natural Colorings from Swirls and Spice. This cake recipe uses colourful vegetables to create a fun and vibrant look. Ice cream cakes are a favourite in the lazy days of summer. 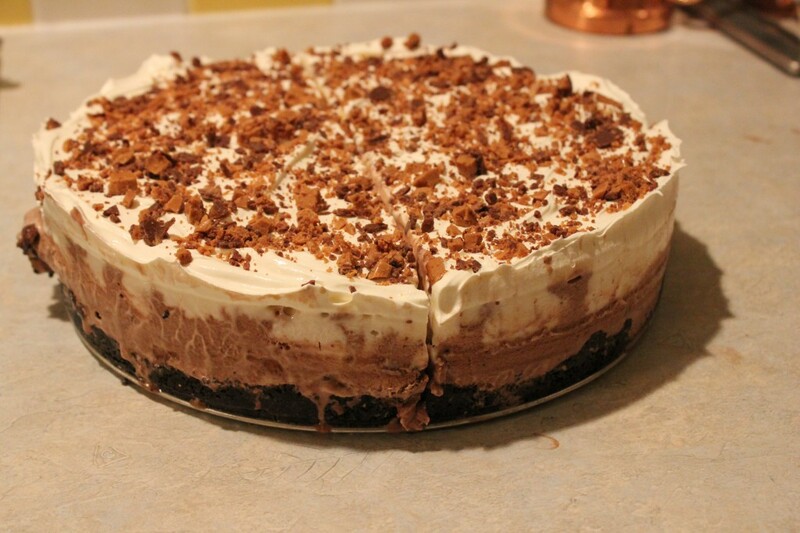 Kitchen Frau shows you how to make your very own right at home with this Home-made Ice Cream Cake recipe! We fell in love with this cake recipe from Bakersbeans. Why do we love it so much? What looks like simple brownies is hiding a sweet and spicy surprise! Run on over and sink your teeth into this Brownie Cake recipe (we can’t wait too!). 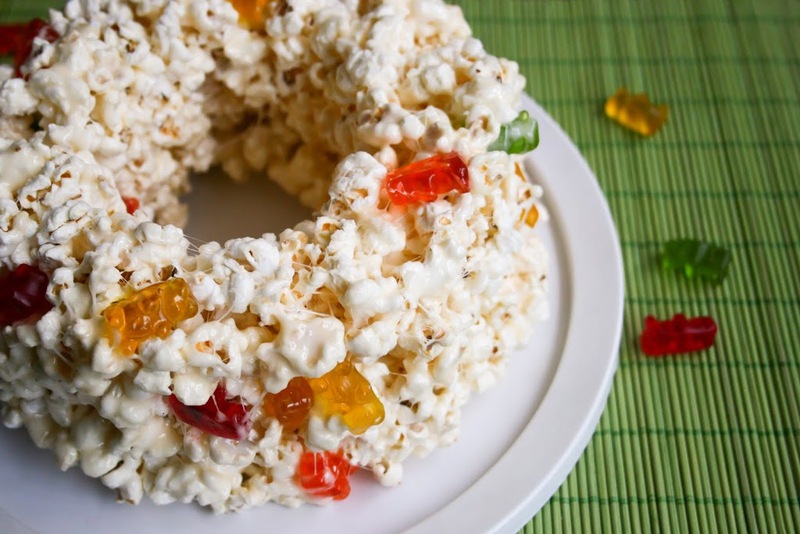 Here’s a great cake recipe for kids and movie-lovers: Popcorn Cake from Food & Whine! It’s a cleverly unique cake, that already has us thinking of variations on decorating ideas for the popcorn aficionados in our lives! How about something with fruity and floral notes? This Raspberry Cake with Pistachio and Rose Water Swiss Meringue Buttercream from Giramuk’s Kitchen might just be what you’re looking for! No time to bake from scratch? 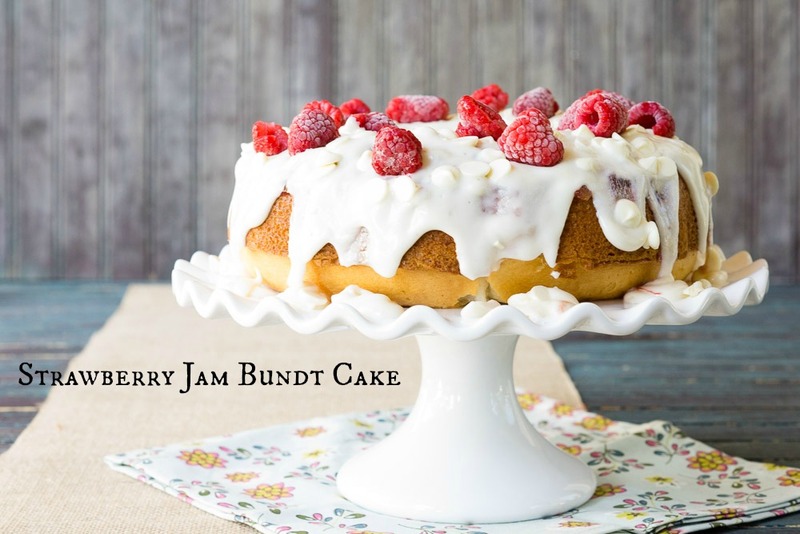 Then you need this Strawberry Jam Bundt Cake from The Lazy Mom’s Cooking Blog! Whip up this tasty treat in no time… and go ahead, tell them you slaved all day. How do you make a pineapple upside down cake better? You add bananas! That’s exactly what The Front Porch Gourmet did with their Pineapple Banana Upside Down Cake recipe. Love citrus fruits? 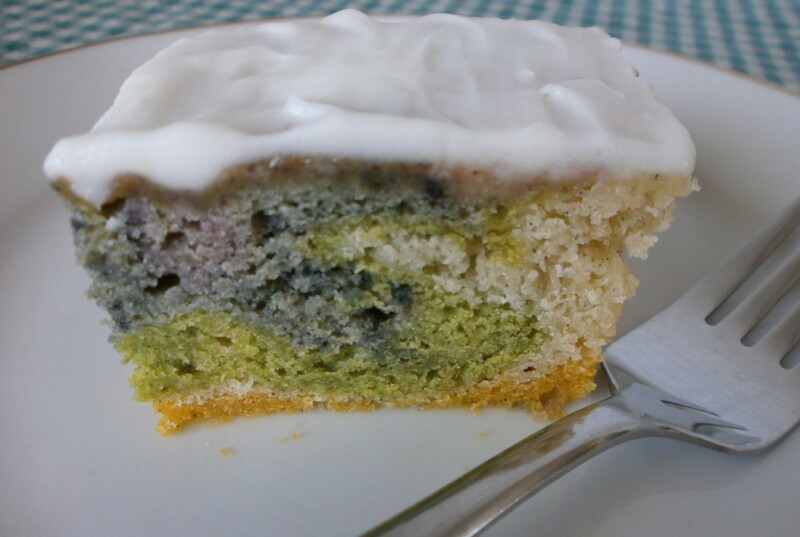 Want a cake with vibrant citrus flavours? 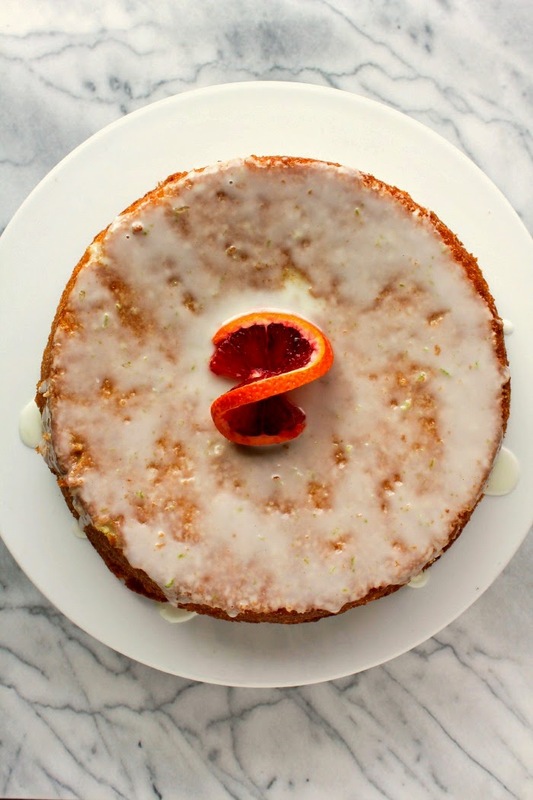 Check out this Blood Orange Olive Oil Cake recipe from The Chef Next Door. How about a classic chocolate cake? 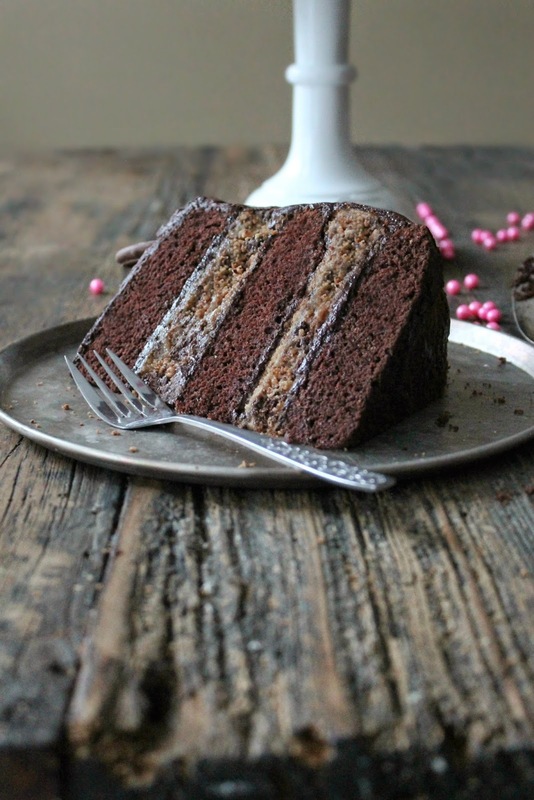 Try this German Chocolate Cake recipe from Food Mamma. Looking for smaller bites of cakey-goodness to share? Then you need these Double Chocolate Chip Coconut Brownies from Diary of an Ex Sloth. Try this intriguing flavour combination from Killing Thyme: Earl Grey Bundt Cake with Blood Orange Syrup. Cake isn’t just for kids anymore. You can’t go wrong with strawberries, whip cream, and chocolate when it comes to cake. Head on over and devour this Strawberry and Chocolate Shortcake recipe from The Tiffin Box. Let them eat cake… but if they don’t like cake, maybe they’ll love these Birthday Cake Pudding Shots from Culinary Cool! Want a rich, dark and moist cake? We think this Chocolate Chip Cookie Blackout Cake recipe from The Brunette Baker might just be the cake you’re looking for! This Paleo Curry Carrot Cake recipe from The Primal Desire showcases exotic spices to give a simple carrot cake a unique twist! Spring is in the air and what better way to celebrate than to celebrate with flowers! 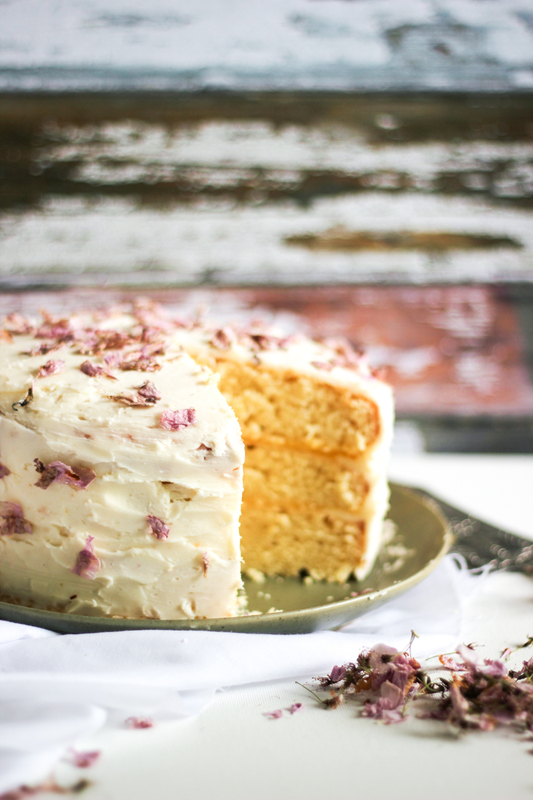 This Spring Cherry Blossom Lemon Cake (with Vanilla Buttercream Frosting) from She Eats hits all the right floral notes for a perfect cake to mark the season. No time to bake? 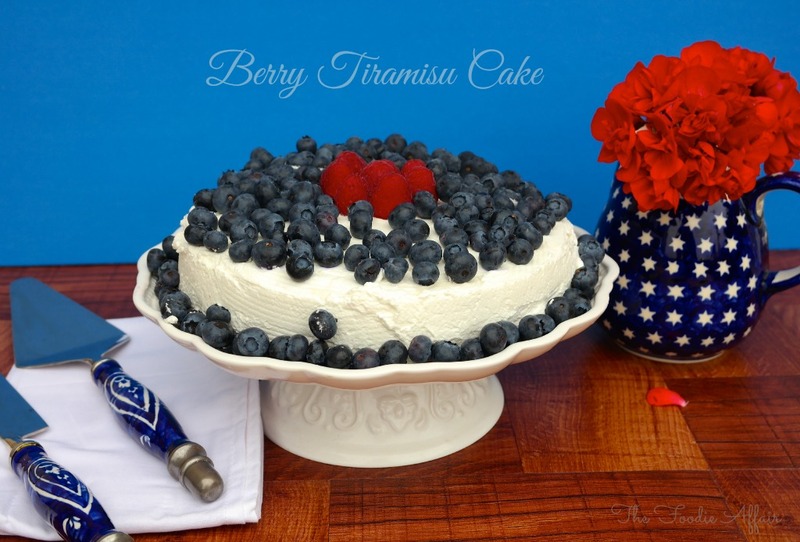 This no-bake Berry Tiramisu Cake recipe from The Foodie Affair is loaded with raspberries, blueberries, and fresh whipped cream. We’re crazy for this Crazy Cake recipe from Butter, Basil and Breadcrumbs. Learn how to make a moist and delicious chocolate cake without butter, eggs, or milk. Totally, crazy, right?! Special thanks to our blogging friends in Canada and the United States for contributing so many awesome cake recipes to help us celebrate our first year blogiversary! Looking forward to another year of networking, sharing ideas, and making new friends! Cheers! Happy Blog Birthday! It’s an exciting milestone Great round up of cakes.